It’s good to consider how you’ll be spending your wedding day from start to finish when choosing your dress(es). Your dream dress for the ceremony may differ slightly to your ideal look for the evening reception for example. 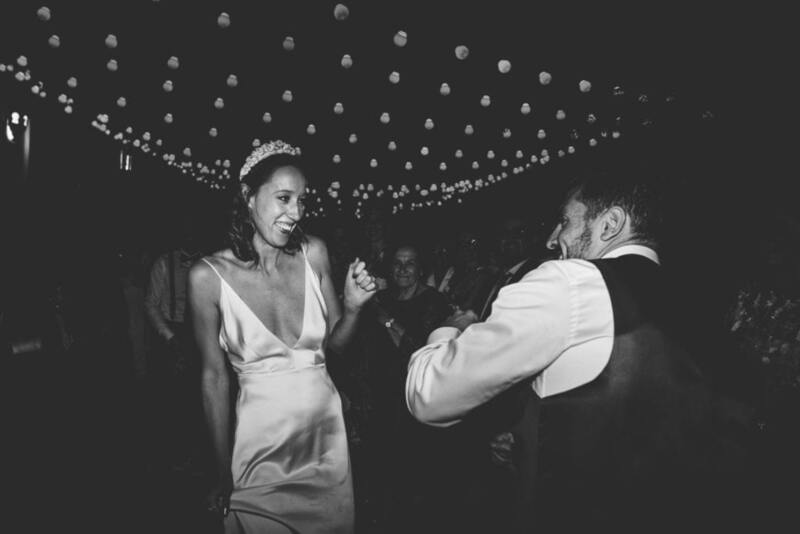 An immaculate, flowing white gown is perfect for the ceremony but can become a little cumbersome when dancing with friends and family later on. In addition, if you’re having a religious ceremony, some churches require shoulders to be covered. Hence, some brides choose two separate dresses, one for the ceremony and another for the reception. 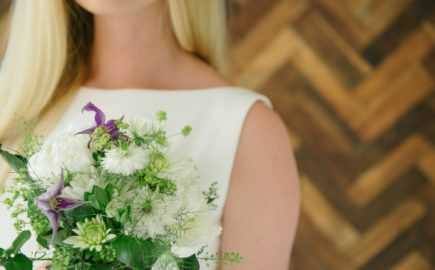 Many brides like to have an entirely different dress look for each stage of the celebrations, to create a different style to suit each part of their wedding day. Andrea Hawkes creates designs that offer the styling flexibility to create more than one look – day and night – with just one outfit. This week, we’re showcasing some of our dresses, worn by real brides to demonstrate how our dresses can be worn during your wedding day and – with a twist – at your reception. 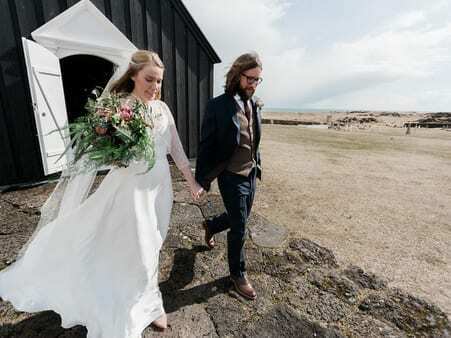 By sharing photos of the couples and detailing how the brides’ dresses transformed into evening outfits, you can see how these brides wore a dress that does both. Here’s how you can plan your dress and accessories to create two different but complementary outfits with one dress. Felicity choose a Drew Lace op to complete her day outfit. Once the ceremony and signing of the registers was finished, she could remove this to reveal the simplistic and classic Drew Silk dress underneath. Paired with her lipstick choice (below), this was perfect for an evening of celebrating. 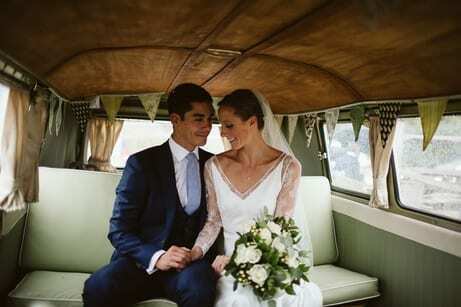 Jo wore an Andrea Hawkes bespoke lace top and beautiful veil. Later on she was able to remove the veil and lace top to bare a little more skin and wear an even simpler look once she and Justin had tied the knot. 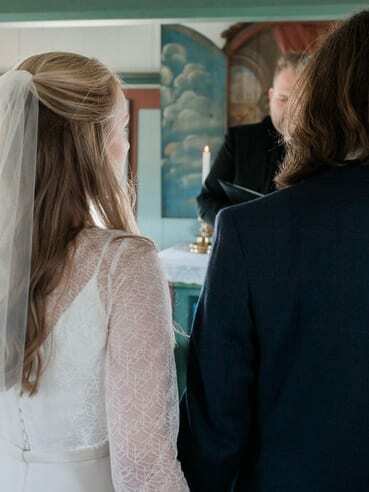 Both outfits were completely in sync with their country style wedding and the vintage campervan they left the Church in (below). 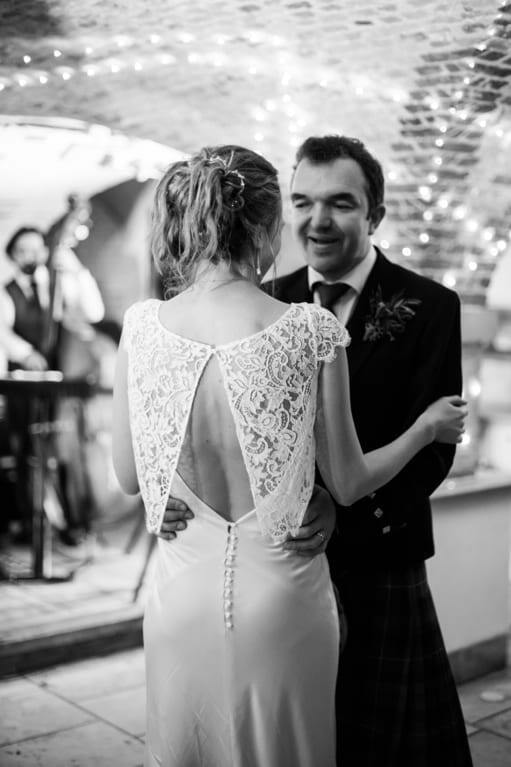 Aly’s beautiful silk dress looked classic yet contemporary when styled with our Willow lace top for her ceremony. The lace gave her the perfect cover over her shoulders in church, creating a complementary look for the late evening once removed. Veils, bridal headpieces and overskirts also help with the transition from ceremony to party. 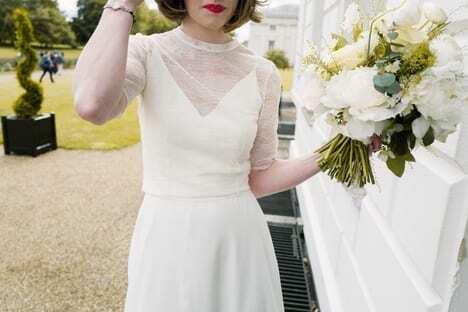 The Clarice overdress chosen by Siobhan is great for both modern weddings and more traditional affairs. Siobhan looked picture perfect leaving the Church (featured image of this post) and at her celebrations afterwards (below). 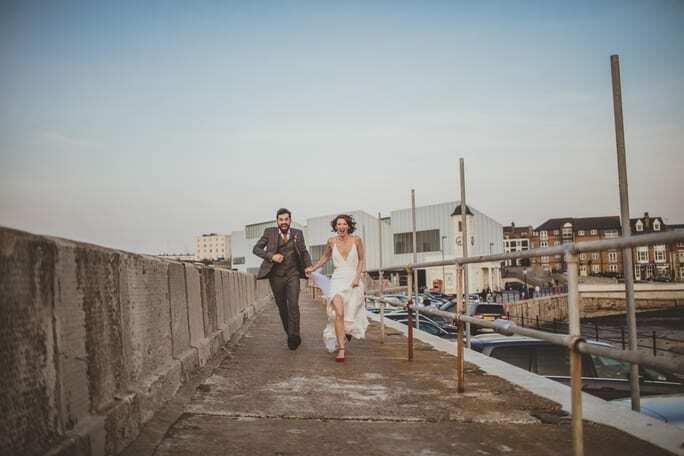 With her Rachel lace top and her understated, flowing veil, Jayne was a classic bride with a modern twist. 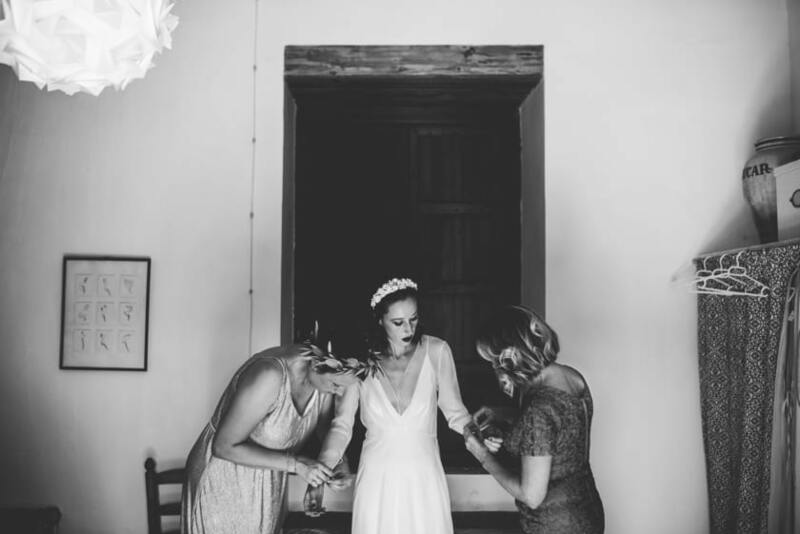 Little did Tom and her guests know that underneath these was a simple white dress which – without these – and with the right shoes, made the perfect wedding party dress. Harriet wanted to be able to dance in her dress, so Andrea and the team worked with her to create a dress that enabled her to do so with ease. This bride was party ready from the moment her cascading veil was taken off. Her red shoes and nails added a subtle touch of fun to a wedding dress that oozes modern, understated elegance. With veils, tops, headpieces, overskirts, belts, capes and jackets you can have a wedding dress that is styled to suit every wedding and both the day and night celebrations. Read our blog post on wedding dress accessories to find out more. 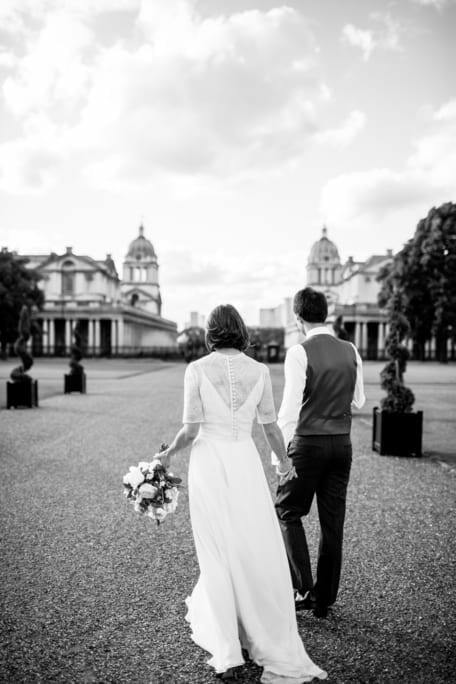 For more inspiration from Andrea Hawkes brides, visit our meet the brides page or explore our Instagram account.